Two kids were always in the cards for Rebecca Romijn and Jerry O’Connell. Despite battling infertility, the couple planned for a future as a family of four – and were doubly blessed when they discovered that not only was Romijn pregnant, but they were expecting twins! And while tackling twins is tough, the couple are taking on the task alone – without the help of a full-time nanny. “We’re each other’s assistants. We pick up each other’s slack. Whoever is less busy helps the busier one: ‘Can you go pick up this for me?’ or ‘Can you book my flight? 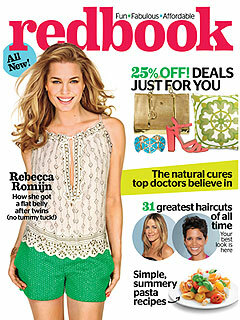 '” Romijn, 40, says in Redbook‘s August issue. Adding to the difficult job of managing multiples is Romijn’s work commitments. With the King & Maxwell star shooting on location in Canada, O’Connell is on full-time daddy duty, bringing daughters Charlie Tamara Tulip and Dolly Rebecca Rose back and forth from their Los Angeles home to Vancouver to visit their working mama. But, due to the couple’s “very different” approaches to raising their 4 -year-old girls, watching O’Connell step up to the parenting plate hasn’t always been easy. Fortunately, Romijn has realized handing over the reins isn’t always a recipe for disaster. “It’s hard for me to not make suggestions when I’m not on duty. For example, 10 days ago when he was bringing the girls up to Vancouver, I was like, ‘Oh, God, he cannot forget their jackets. I have to remember to tell him to bring rain boots,'” she says. Still, the actress admits jugging both her personal life with her professional career is a constant challenge. “Sometimes I do get a little teary. Jerry and I will see the girls running ahead of us and say, ‘Look at them, they’ll never be this little again – not even 10 minutes from now,'” she says. It has been almost six years since Romijn and O’Connell tied the knot – later welcoming their daughters and settling into their family routine – but a big part of the former model’s previous marriage is still a popular topic for the public. “Oh my God, it happened to me last night!” she says in reference to still being called Rebecca Romijn-Stamos. But not so fast, says Romijn – her surname is still subject to change sooner rather than later. “At a certain age I think it’ll be my girls who ask, ‘Why is your last name different than ours?’ Once it matters to them, it’s going to start mattering to me. And also for Jerry,” she says.